Initial Area of Concentration: Rural Bangladesh (a sub-continental nation the size of Wisconsin and a population approaching 150 million - the third poorest country in the world). Initial Project: Establishment of a permanent medical clinic in the remote northeast region of Bangladesh (the Tea Gardens). The area has no fixed medical service among this population of people most of whom cannot even spell their own names. Future goals for this region include construction of an orphanage and boarding school. Initial Need: The land purchase requires $100,000 US currency and construction costs are estimated at $125,000 for a free standing medical clinic and orphanage/boarding school facilities for 25-30 youth. Why Bangladesh? Why this type of ministry? Why now? The foundation was formed as a result of the burden of need seen through the eyes of a young American physician, Dr. David Berdy of Toledo, Ohio. In the last 6 years of medical practice, Dr. David (as Bangladeshi people call him) has traveled to Bangladesh annually to administer care to those who cannot care for themselves. “Over the journey, it has become apparent to me that the best way to edify the need is not with a handout, but with a helping hand, one that remains linked to those trapped in an impoverished existence until they can reach out to others - in effect ‘spanning the gap’ to self-sufficiency,” remarks Dr. David. That is the impetus for such a work as Bridge of Grace. There are already in place Bengali nationals, including a physician, who are trained to help their fellow countrymen if the capital support is committed. We are told that this kind of thinking in ministry, namely encouraging nationals to reach out to their own people is revolutionary and poised for unprecedented success. After all, who better understands your need and how best to meet that need than someone like you, someone who has experienced your place in life. Simply stated: it just makes sense! A commonly quoted proverb states that if you give a man a fish, he eats for today, but if you teach him how to fish, he eats for a lifetime. 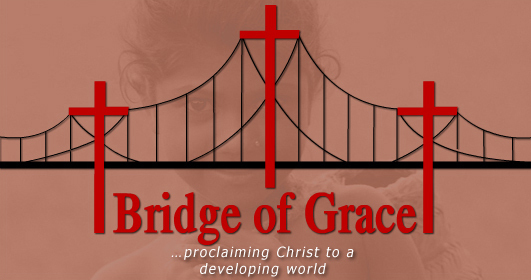 Bridge of Grace simply seeks to put that adage into practice. Amidst the medicine and education, the social reformation and financial underwriting, we at Bridge of Grace are steadfast in our mission to tell others about the hope for a better life in Christ. We believe that our charge to ministry comes from God and that He alone is the authority for truth and that He has communicated that truth to all men through the inspiration and preservation of the Bible. According to that truth, we believe that man has rejected and has been separated from God because of sin and that the penalty for sin is death. However, God offered forgiveness from sin by sending Jesus, His unique Son to not only show man how to live here on earth, but how to have life eternal in a place called heaven. Jesus accomplished this by paying the penalty for mans’ sin through His death on a cross and by the power of God, overcame death in His resurrection. Finally, a man who believes in Jesus and His sacrifice on our behalf is restored to God by the one true ‘bridge of grace’. compassionately, anything else we do will not have any lasting value.